How Does Geofencing Work? What is a Geofence? Geofences are simply virtual perimeters, within which an advertiser or marketer runs digital ads. But how do they work? And what’s the right size for a geofence? We’ll attempt to break down those answers here. Geofences are built using specific – and often times, software that takes the longitude and latitude data of a specific location and uses that information to build a virtual perimeter around it. Geofences can be as large as entire states or countries, or a small as a city block, or even a single building. They can also vary in shape. Most are round and use the latitude-longitude location as the center point, but they can also take the form of a polygon for more precise targeting. What’s the right size geofence? This answer largely depends on your goals. For events, we typically recommend geofencing the event venue and setting the perimeter to roughly a mile around the venue so that nearby hotels are included. Since most conference attendees prefer to be within walking distance or a short cab ride away from the convention center or conference hotel, this ensures you’re capturing the attention of attendees when they’re back at their hotel and may have a bit more downtime to look at their phones or laptops. 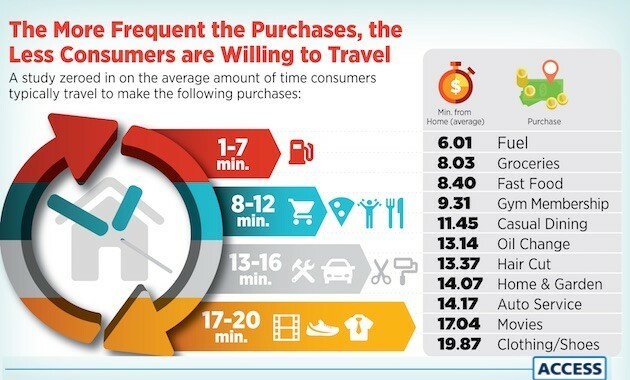 If you are a retailer a study suggested that 93% of customers would travel only 20 minutes or less for everyday purchases. For a grand opening of a retail store, we may recommend going a bit bigger, such as 5 miles around the store, or even as big as the zip code. Since broader consumer awareness is the goal, targeting just around the shopping center will limit you to the foot traffic you’d already likely experience. Sometimes bigger is actually better. Is the geofence always active? It doesn’t have to be. With our systems, we can set specific times of day or days of the week for the geofence to be live. For example, if you’re Taco Bell and you want to target college kids looking for a late-night snack on the weekend, you could set the times for 9pm until 1am on Fridays and Saturdays only. For business conferences, you may only want to set the times for 8am until 6pm during the days of the conference and pre-conference. More geofencing case studies here. With geofencing, so much of your campaign can be completely customized, which is why it’s important to consider the goals first and foremost. Bottom line: It’s important to work with a mobile strategist who will guide you on best practices. Self-service platforms have their benefits, but it’s worth the minimal investment to work with a full-service agency like ours to get you on the right path, especially if you’re new to geofencing. Best of all, we don’t charge extra for our strategic counsel. It’s just part of the service we provide to our clients. Our pricing can vary based on key factors of a campaign such as number of locations targeting, additional layering, formats or special landing page requirements. We currently start at *$2000 and give volume discounts for larger buys. *Subject to change based on date.